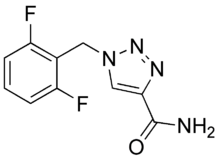 Rufinamide(see structure) is an anticonvulsant medication and a triazole derivative, was developed in 2004 by Novartis Pharma, AG, and is manufactured by Eisai. It is used in combination with other medication and therapy to treat Lennox–Gastaut syndrome and various other seizure disorders. Rufinamide. Rufinamide was approved by the US FDA on November 14, 2008 as adjunctive treatment of seizures associated with Lennox-Gastaut syndrome in children 4 years and older and adults. Its official FDA-approved labeling does not mention use in the treatment of partial seizures inasmuch as clinical trials submitted to the FDA were marginal. Interestingly, now researchers from the Arkansas Epilepsy Program found treatment with rufinamide results in a significant reduction in seizure frequency compared with placebo, for patients with uncontrolled partial-onset seizures (POS). Researchers found that treatment with rufinamide resulted in a statistically significant reduction in total partial seizure frequency compared with placebo. Results also showed a 50% reduction in responder rate and total partial seizure frequency rate in patients treated with rufinamide. Several exploratory efficacy variables, including at least 75% responder rate and increase in the number of seizure-free days, were also associated with notably better results for rufinamide. "Overall, there were no significant pharmacokinetic (PK) effects on either rufinamide or any second-generation AED when given with other medications." The research team confirmed PK results found in previous studies-showing lower oral bioavailability of rufinamide at higher doses, increased clearance of rufinamide with increasing body weight, and no effect of prolonged rufinamide dosing on the PK of rufinamide.